How much does it cost to travel to Nepal? How much money will you need in Nepal? NP₨2,901 ($26) is the average daily price for traveling in Nepal. The average price of food for one day is NP₨880 ($7.89). The average price of a hotel for a couple is NP₨2,818 ($25). Additional pricing is in the table below. These average travel prices have been collected from other travelers to help you plan your own travel budget. How much money do I need for Nepal? Nepal is most famous for its trekking opportunities in some of the world's most stunning scenery. The Himalayan Mountains form a breathtaking backdrop as you explore the small towns along to the Annapurna Circuit or head up to Everest Base camp. The trekking options are plentiful and cater to all comfort levels. It's easy to find a two or three day hike just outside of Kathmandu, or you can venture into a month long adventure exploring the diverse landscapes that make up the Himalayan Mountains. Other outdoor activities include rafting, jungle safaris, and paragliding, but hiking is really the ultimate experience in Nepal. Many travelers fly into Kathmandu, the country's capital, only to rush out a day or two later. Although Nepal's true appeal is its natural landscape, Kathmandu offers a wonderful glimpse at the country's rich culture. Over half of the country's population lives in this city, and to skip it is to skip a large part of what makes Nepal thrive. This is city for the senses. Enjoy Nepalese food at restaurants that are open late into the night, wander through the streets, visit the monkey filled temples, and meet the locals. Nepalese people are some of the most friendly you will encounter. Buddhism and Hinduism meet in this vibrant country, and that is best reflected in the temples and sights around Kathmandu. Travel costs in Nepal are perhaps some of the lowest in the world. Particularly during treks you can expect to spend little more than a few dollars a day. Some treks require a porter or guide, while others are best enjoyed on your own. Assess your fitness level and ask other travelers to learn how well marked a trail is before deciding if a guide is necessary for you. As you hike further into the mountains the cost of food and water will go up. Come prepared with your own way to sterilize water and you'll save yourself some money. Most guesthouses require that you eat a meal at their restaurant so confirm this policy before committing. Food at most restaurants are comparable in price and quality, so this policy allows hotel prices to stay to a minimum. Although trekking in the Himalayas is the most popular activity here, there are countless other outdoor activities you can participate in. These include jungle safaris, bicycling trips, whitewater rafting, and hang gliding. If you're an adventure sport enthusiast, there is no shortage of things to do in the beautiful country. There are many different treks you can participate in, some that are just a couple of days to others that are weeks long. Many people choose to hire a porter or guide for their treks, even if they are short. This is beneficial for first time trekkers, but it isn't always necessary. Depending on where you choose to go, it might be more fun to go it alone. Trails are often well marked and many are popular enough that you will likely never be completely alone. Find some travelers who have just returned from you chosen trek and ask them about the trail conditions. They will likely be your best source of information. If you're planning to do any trekking in Nepal, it is best to choose you season well. There are reasons that some seasons are more popular than others. The monsoon rains usually hit between June and September while the winter cold prevents most hiking between January and March. Spring and Fall are really the best, and in some cases only, times you can hike in the Himalayas. Many treks require a permit for foreigners. Research the hike you are planning to do in advance so you completely understand what you need in preparation. Most permits can be acquired in Kathmandu with minimal effort and time, but do make sure you have a few days to ensure things go smoothly. If you plan to stay in guesthouses along the trek then you won't need to take as many supplies. Most guesthouse owners expect you to enjoy dinner in their restaurant. This is how they are able to keep the price so low. Don't skip out on the meal as it is unfair to the owner who will loose money. You might also find yourself paying a dramatically higher fee for the room than you expected. Looking for a hostel in Delhi or Goa? Heading to Kathmandu or want a party in Tel Aviv? Annapurna Circuit: One of the more popular treks in Nepal, this trail takes you through the villages along the Annapurna Region and takes a little over two weeks to fully complete. 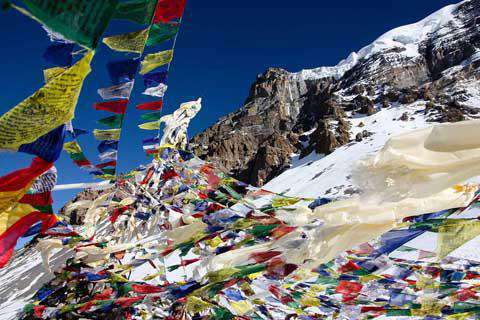 The highest point on the trek is Thorung La Pass which is 5400 meters high. It's a moderate level of intensity but the high altitude can prove challenging for some. Everest Base Camp Trek: Starting in Lukla, this is the most popular trek up to Everest Base Camp. It's a well marked, popular trail and although the hiking is quite challenging, there are many places to rest and spend the night. Chitwan National Park: A great place to do a jungle safari and ride an elephant, Chitwan National Park offers a fun alternative to the hiking most people enjoy in Nepal. Nepalese food combines some aspects of Indian cuisine with some characteristics of Tibetan food. Rice accompanies most meals and there is often a lentil dish as well. The country's national dish of Daal Bhaat is ubiquitous and can be found on almost any menu. Daal Bhaat Tarkaari: The national dish of Nepal is a lentil dish served with rice and tarkaari. Tarkaari is a mix of vegetables served with spices. If you spend any length of time in Nepal, you'll become all too familiar with this dish which is available for breakfast, lunch or dinner at almost every restaurant. Momos: This is a traditional meat or vegetable dumpling dish that is typically served with a tomato based sauce. It's a popular option for a late night snack while you're in Kathmandu. During treks, most momos are vegetarian and substantially more expensive than the options that are available in the city. Samosas: These meat or vegetable dumpling dishes are deep fried and served with a sauce. They're a popular street food that's available in the cities. In a country like Nepal it is much cheaper to book your porter and guide after you arrive. If you have the time and flexibility when traveling, this is definitely the way to go. This allows you the opportunity to meet the person who will be traveling with you and confirm that your personalities are compatible. It also will save you a lot of money! A lot of people zip in and out of Nepal's capital city, Kathmandu, on their way to the Himalayan Mountains. While the obvious reason to visit Nepal is the trekking and outdoor activities, don't blow Kathmandu off. It's actually a very fascinating city that gives you a lot of insight into the country's culture and people. There are plenty of temples to explore, but simply exploring the neighborhoods and roaming through the markets can really be an experience. While you usually visit Nepal to hike, make sure you see every thing the country has to offer by seeing where the vast majority of the residents call home.